A Golden Guardians of the Galaxy Costume Made from Worbla « Adafruit Industries – Makers, hackers, artists, designers and engineers! Guardians of the Galaxy Vol. 2 featured the introduction of the Sovereign, a genetically engineered race led by the Golden High Priestess Ayesha. The golden is literal, as the Sovereign have gold skin and hair. I’ve only seen a couple costumes depicting any of the Sovereign, and I think the whole all-over gold body paint commitment is part of the reason why. Redditor exaltedStarfish‘s sister wasn’t intimidated though and chose Ayesha for her first ever cosplay. 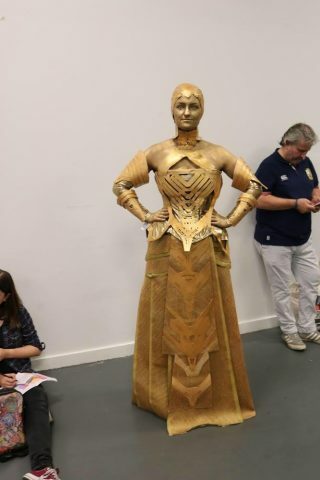 She invested about 70 hours into the costume, using Worbla for the armored top and non-slip mat for the bulk of the skirt.